Now, it appears ISON did survive its close encounter with the sun. camera (ESA&NASA/SOHO/SDO) Comet ISON moves closer to the sun in this image composite with the sun imaged by NASA's Solar Dynamics Observatory in the center, and SOHO showing the solar atmosphere, the corona captured at 10:51 a.m. EST, Nov. 28, 2013. It was thought to have died, but now it appears comet ISON lives on to fight another day. In the battle "Fire vs ISON," last night appeared to have declared fire—or the sun—the victor, but new images out this morning show ISON is still intact. 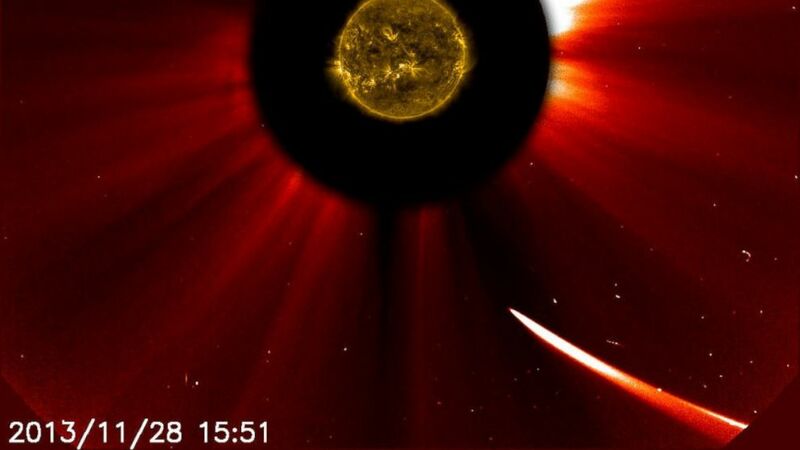 In a tweet posted by NASA this morning, new images show that ISON did reappear following its slingshot around the sun. "Is it or isn't it? New data indicates it may have survived," NASA tweeted. "My reaction was 'Wow, this is crazy,'" solar physicist Alex Young of Goddard Space Flight Center told ABC News. The comet ISON, named after the International Scientific Optical Network which discovered it last year, made its closest approach to the sun Thursday at 1:37 p.m. ET. But on Thursday, toward the end of a live NASA-hosted Google+ Hangout to answer questions about ISON on Thursday, Young had said it was "unfortunate that it doesn't appear that we'll see it." Young speculated that the comet "was not stable enough or perhaps the gravity from the sun [was the cause]" of the comet's disappearing Thursday evening. Adding that even if it had disintegrated, it still would offer a glimpse into how comets interact with the sun's magnetic fields. Last night, NASA tweeted poignantly, "Like Icarus, #comet #ISON may have flown too close to the sun." But today Young tells ABC News that there were a couple of reasons why they thought the comet had died. Mainly it was the inability to see it from the Solar Dynamics Observatory (SDO). Launched in 2010, the NASA spacecraft SDO watches the sun round-the-clock, capturing high-definition images of the sun's atmosphere with a level of detail not seen before. "We were monitoring the data from SDO. We had seen two comets before as [they] passed through the sun's atmosphere with SDO that were 10 times smaller than ISON. Based on past experience, it gave us a pretty good idea we should see it this time too," Young explained. "Given the fact that we didn't see it—we didn't see anything when it was passing closest to the sun in SDO—we just concluded that it probably hadn't made it." When initial data started to come out, scientists thought it was remnants of the tail. Only upon further examination did they realize the comet was still intact. "We were pretty sure that it was gone, and my second thought was, What in the world happened? Why didn't we see it in SDO?" Young said. "Now there is this mystery. Is there something different about the comet's composition?" The previous two comets spotted with SDO were 10 times smaller and passed much closer to the sun. ISON, however, passed the sun at a much greater distance and passed by a different magnetic field. SDO tracks comets based on the gasses emitted from the comet and therefore the "light it gives off." "You have to have enough oxygen and iron. They get really hot and when they do they start glowing, they put out a certain wave length of light. If they aren't putting out enough of that light, because of its makeup, you just won't see it [on SDO]," Young explained. "Main thing is we now have this puzzle and fill in the pieces and figure out what is going on," Young said. "We were pretty disappointed we didn't see this great imagery through SDO but at the same time it gives us another great scientific mystery to figure out, and I guess that is why we do this." The comet's journey took it approximately 730,000 miles away from the sun's surface. Skygazers can plan on seeing the comet come Dec 1. "It would be low in the sky early in the morning," Young said. "Each day it will go higher in the sky and be visible earlier in the morning, closer to midnight. By the 17th it will be up or around the Big Dipper and should be visible closer to midnight."